Hebrews 10:11-13 And every priest stands daily at his service, offering repeatedly the same sacrifices,which can never take away sins. But when Christ had offered for all time a single sacrifice for sins, he sat down at the right hand of God, waiting from that time until his enemies should be made a footstool for his feet. I don’t know how much you know about baseball, and I’m no expert, but I have been around baseball a lot in my life. In high school I was a bat-girl (I even lettered in baseball – technicalities!). My father has always loved baseball, so almost every summer vacation had some element of baseball included. I love the history and they traditions of baseball. One thing that sometimes happens in baseball is called the sacrifice. It can be a bunt or a fly ball. 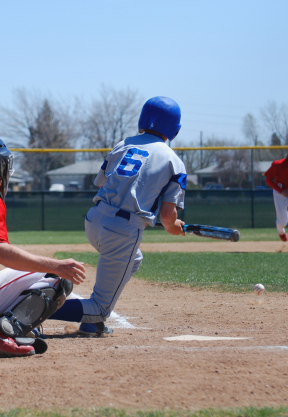 What happens is the batter will hit or bunt the ball, expecting to get out. He knows he’s not going to get on base. He’s planned it that way (or his coach did). Why? Because it allows the other player to get home. Does a batter want to hit a sacrifice? Probably not, it’s not as fun as getting a hit and getting on base. Coming to the bag, he knows he has to give up his chance at a home run or a hit so the other player can be assured he’ll make it home. Jesus came to earth, knowing he was going to have to make a sacrifice play. He was going to have to give up his life so we could be sure to make it home. Without Him taking our sins on his shoulders and getting us out of a jam of sin, we couldn’t be sure we would ever make it to our heavenly home. Seeing the mess we had gotten ourselves into with sin, our coach, God knew that a sacrifice had to be made. The only way to assure we would make it home was with a well executed sacrifice. He wanted to make sure it was done right, and so he sent His best player, His Son Jesus Christ. Not only did Jesus have to do it right on the day, but He also had to train well, living His life perfectly before the big day. Jesus knew He could stay safely in heaven. He could enjoy the rewards, but He knew we would never make it home if He didn’t do the sacrifice play. He did it for us, for the team and for His Father in Heaven. It was part of the plan to get us out of the tough situation of sin we had found ourselves in since the fall.